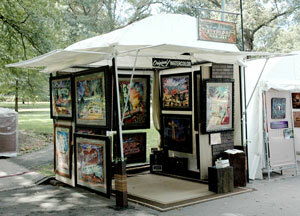 Your artwork plus our strong, durable, easy-to-use artist canopy are a reason to show off to the world! Become a part of our Show Off Your SHOWOFF series and let us help market your business through our social media and email marketing campaigns. Every month, we feature a different artist and their work being displayed on the best artist canopy booth available  The SHOWOFF Art Canopy! Contact us at info@showoffcanopy.com to become a featured artist or to find out more about this exciting program. By participating in Show Off Your SHOWOFF, you're agreeing to let us use your SHOWOFF Canopy photo on our website and in our social and email marketing. Read about our artists on our blog.